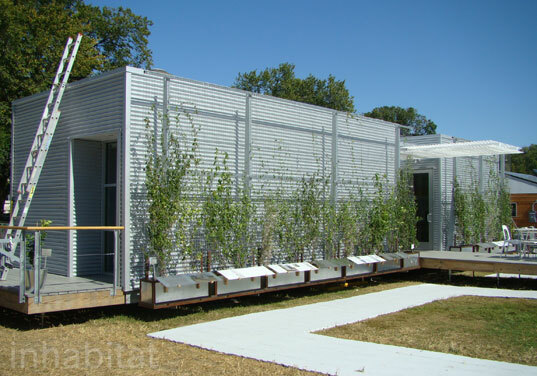 The Solar Decathlon, the super solar architecture competition held in Washington D.C. bi-annually, officially kicked off today, and Rice University‘s awesomely affordable ZEROW House is already making waves. The first round of evaluations took place yesterday, and this low-budget underdog placed 4th among the twenty competitors after being recognized in the categories Comfort Zone and Appliances. What is most impressive about this team is that the average budget of the 20 solar decathlon houses at the mall is $490,000, while the ZEROW home was built for only $140,000!!! Even more impressive, the ZEROW House was designed specifically for Houston’s Third Ward Neighborhood as part of Project Row House – an organization that seeks to develop housing for low-to moderate-income families. The ZEROW team’s momentum has been going strong since day one, allowing them to be the first to both complete their house and pass all of their inspections. As of yesterday, the ZEROW House was able to create 29 kilowatt hours of surplus energy since they began measuring back on Tuesday. Taking advantage of smart passive design strategies allow the shotgun style ZEROW House to generate enough energy using solar technology to run off of the electric grid, utilizing off-the-shelf photovoltaic panels that any home owner could purchase. These panels allow the ZEROW House to supply itself with more then enough energy to operate the ventilation and air conditioning (HVAC) system, heating, appliances, lighting and give it hot water for the laundry, kitchen and bathroom. In addition to the home’s solar thermal collector which absorbs thermal energy from the sun and converts it into usable heat, the home utilizes lysine, spray-foam insulation to minimize air leakage in the walls. LED lighting is used throughout the house, and the average wattage for a fixture inside the ZEROW House is three watts, maintaining the total wattage at below 200. They used Galvalume siding for the exterior because it is low maintenance, able to resist corrosion in the humid southern climate and made from 25 to 35 percent recycled materials. Bamboo floors run throughout the home as a fast-growing alternative to wood that is more durable then laminate. 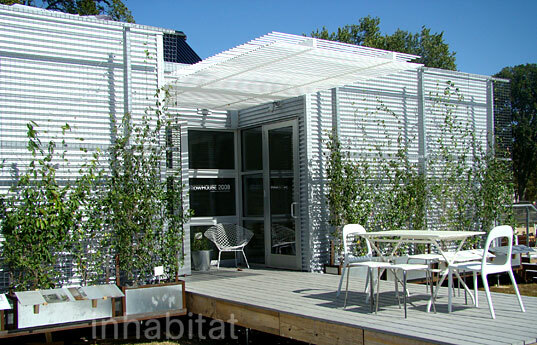 Boosting both the aesthetic appeal of the home and the solar shading is a green wall that features native plants such as coral honeysuckle and star jasmine to unite the house with its surroundings and contribute to passive cooling by shading the south side exterior from excessive heat gain. The ZEROW House is one of our favorite contenders in this year’s Solar Decathlon, and we can’t wait to see what will happen over the next seven days. We’re rooting for you team ZEROW! Don’t forget to check out our Solar Decathlon photos and the rest of our breaking Solar Decathlon coverage too – we’ll be updating our on-the-scene coverage all through today and next week. by far the best "bang for your buck". yes, it is small, yes it lacks windows, the insulation is more appropriate for TX than NY or WA climates but remember that they where working with a specific lot in mind and thats how they designed. Im sure - in fact I specifically asked and they showed me how these concerns can be overcome. The price is right but the design looks like a storage shed. Not something I would like to live in. The Solar Decathlon, the super solar architecture competition held in Washington D.C. bi-annually, officially kicked off today, and Rice University's awesomely affordable ZEROW House is already making waves. The first round of evaluations took place yesterday, and this low-budget underdog placed 4th among the twenty competitors after being recognized in the categories Comfort Zone and Appliances. What is most impressive about this team is that the average budget of the 20 solar decathlon houses at the mall is $490,000, while the ZEROW home was built for only $140,000!!! 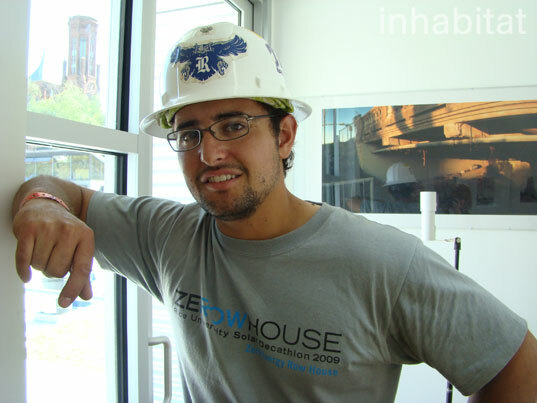 Even more impressive, the ZEROW House was designed specifically for Houston's Third Ward Neighborhood as part of Project Row House - an organization that seeks to develop housing for low-to moderate-income families.